BASIS Curriculum Schools is no stranger to making the news—whether its large scale recognition for its academic program or stories of the differences our students make volunteering in and supporting their local community. We make a point to share these stories out with families and readers, but want to highlight some of the most recent news. The past several weeks have been particularly exciting for our schools—with our Silicon Valley campus’ full profile in Business Insider, a piece announcing the newest Thailand campus, and CNBC’s profile of the best high schools in the country (surprise: BASIS Curriculum Schools occupy the first three spots as well as #5 and #7). The stories are exciting in perpetuating the high performance of legacy at BASIS Curriculum Schools campuses and signify a carving out of a path for new, exciting traditions of excellence. 1) Inside one of the top academic programs in the world. Last week, Business Insider took a look “inside” our sister campus BASIS Independent Silicon Valley to find out how its students are well on their way to becoming the next Elon Musk or Mark Zuckerberg. They discovered that at BASIS Independent Silicon Valley, students are competing at an international standard: sixth graders are already expertly using Bunsen burners while seniors take deep dives into specialized subject matter in capstone courses, and they are achieving higher test scores in math, reading, and science than their global peers. We are so proud of these students and their school for this recognition. Read the article to get a full glimpse into the day-to-day life of the BASIS Independent Silicon Valley learning community. 2) BASIS Curriculum Schools brings an international school to Bangkok. We are thrilled to announce that our globally benchmarked BASIS Curriculum will be available students in Bangkok at the newest BASIS International School slated to open in September 2019! BASIS Curriculum Schools are honored to provide the opportunity for a more ambitious academic program for the families in Rama II area in Thailand—one that not only raises the standards of student learning to the highest international levels, but that is led by passionate expert teachers who are deeply invested in the successes and personal growth of their students. 3) Head of School at BASIS Independent McLean outlines academic vision. 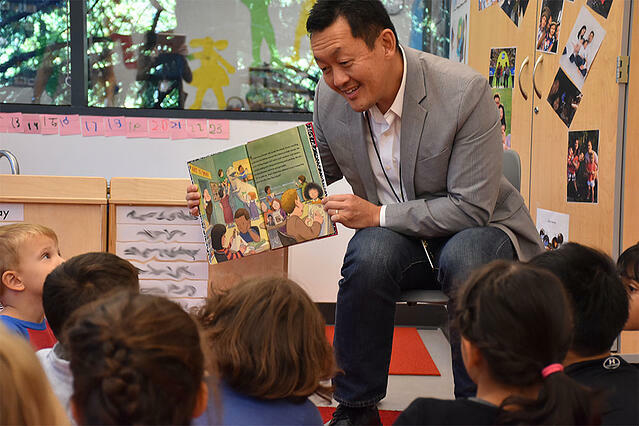 This article by InsideNova offers extensive insight into the amazing Head of School Ron Kim at BASIS Independent McLean! Mr. Kim spent 23 years as a teacher and administrator, bringing an enormous amount of experience to his school community. In the interview, he shares what drew him to BASIS Independent McLean in the first place, as well as some of his vision for the future of education. 4) The 10 best high schools in the country. Congratulations to our sister schools in Arizona for garnering outstanding recognition (again!) in CNBC’s coverage of the U.S. News & World Report Top 10 Best High Schools. Not only do BASIS schools in Scottsdale, Tucson North, and Oro Valley dominate the top 3 spots, BASIS Peoria and BASIS Chandler follow suit with spots #5 and #7. Together, these 5 schools are among a handful of the most challenging and impressive schools in America. We hope you’ll take these article as weekend reading and get a full scope of the impact and reach of our learning community and the new traditions of excellence emerging.